Two decades ago, only about 68% of homes in the United States had air conditioning. Today, you can find A/C window units or full systems in nearly 83% of residences nationwide. What accounts for this jump in air conditioning installation? Is the world getting hotter, or are more homes simply discovering the benefits of keeping their homes at consistently cool, pleasant temperatures? Easily the most obvious sign that something’s amiss, a decrease in cooler air can be detected even by the most inexperienced of home dwellers. Small children and even pets can sense when the air temperature is rising inside the home, and that might be a sign that you’re in need of some serious air conditioning repair. But before you call it in, you can check your vents and air filter for clogs or blockages that might prevent cool air from flowing freely. If the vents and filters look good, it might be time to contact a professional service. It’s always good to scope out the hardware of both your evaporator (the indoor unit) and your condenser (the outdoor unit) in order to spot any electrical or physical malfunctions on sight. Leaking water can be a sign of a broken pump, of a blocked drain or worse yet, that the entire unit has been improperly installed. Just as it’s important to know when to change the air conditioning air filter, it’s also essential to the continued functionality of your system to spot leaks whenever you can. There’s a lot of air conditioning maintenance you can do right at home yourself, but there’s also a lot of technical work that only a highly trained professional should tackle. Looking at a diagram or reading a DIY guide online can only take you so far — at one point or another, you should know when you need to call a proper repair service. 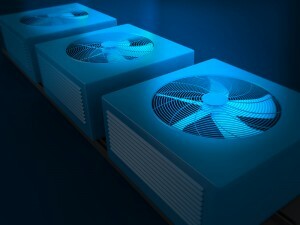 Strange sounds emitting from your A/C unit should always be cause to have a pro take a look. When it comes to air conditioning maintenance, choosing the right air conditioning air filter is just as important as installing the condenser pump correctly. There’s no prize for completing a task all on your own, so don’t ever hesitate to get in touch with a professional service when an A/C problem has left you stumped. Better to do it right than tinker too long — especially when you’re contending with soaring summer temperatures.